One of the main tenets of healthcare reform has been to better align payment and reimbursement schemes to incentivize healthcare providers for achieving improved outcomes and lower cost. Historically, insurance companies (including Medicare) have made separate payments to providers for each of the individual services they provide to patients for a single illness, visit or course of treatment. This payment system, called Fee-For-Service (FFS), incentivizes quantity over quality because a doctor gets paid more when they provide more services. 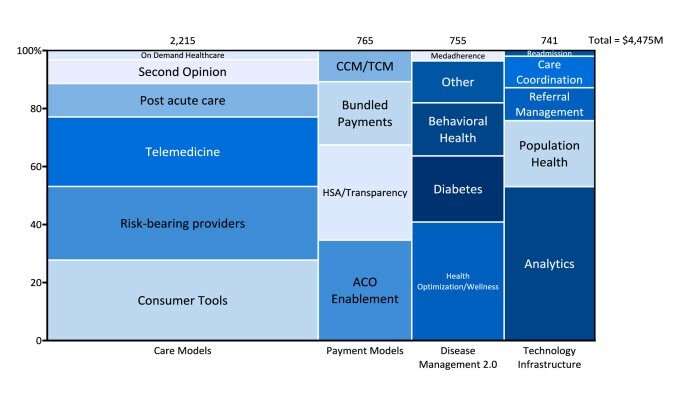 However, this traditional FFS payment model is experiencing massive disruption due to healthcare reform. The Patient Protection and Affordable Care Act (PPACA) advances new reimbursement models which incent doctors on the quality and cost of a patient episode rather than the quantity of services provided. This new system is called Fee-For-Value (FFV). In a FFV system, providers take on financial risk for their patients, meaning that providers share in the burden of a poor outcome and the upside of more efficient and higher-quality care. Since PPACA was enacted years ago, nearly 20 percent of all healthcare payments are value-based. Healthcare industry experts expect this to increase to 75 percent or more by the year 2020. By our account, that’s easily a trillion-dollar-value shift that will take place in the next five to ten years. That’s not just a big, but a massive market opportunity for entrepreneurs and venture capitalists to pursue. By our count, approximately $4.5 billion of private equity dollars have been invested in companies capitalizing on the shift. 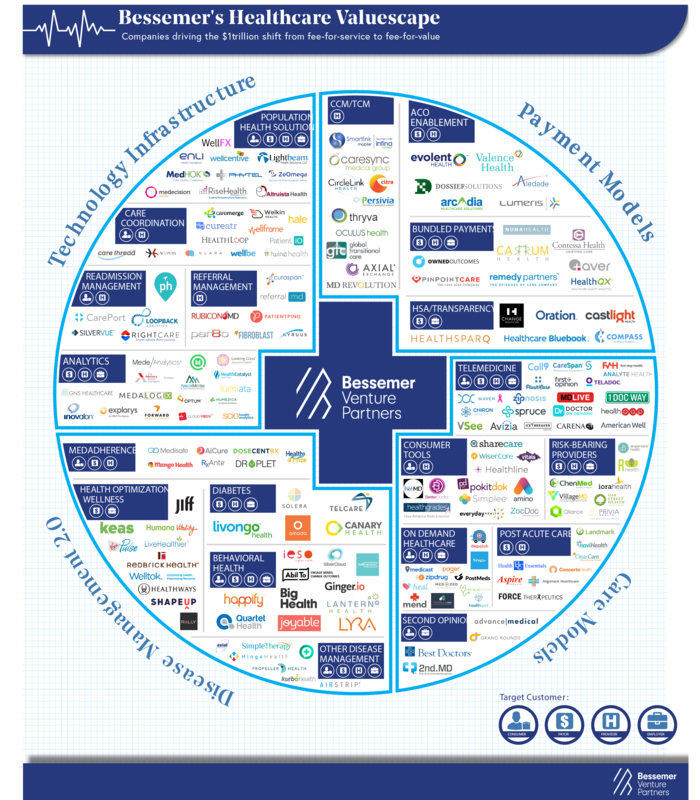 Within the FFV ecosystem, three segments stand out as driving the creation of new companies and capturing the attention of investors: consumer tools, new risk-bearing provider models and telemedicine. Interest in these areas should come as no surprise. In the new value-based world, consumer engagement and technologies that lower the cost of care become critically important to healthcare providers. There are more than 175 companies listed on the Bessemer Healthcare Valuescape; the top ten in terms of venture capital and private equity investment are: Brighton Health, Zocdoc, Castlight , HealthCatalyst, Welltok (our portfolio company), Alignment Health, American Well, GrandRounds, Evolent, and Remedy Partners. Four companies on the Bessemer Healthcare Valuescape (Evolent, Teladoc, Castlight and Everyday Health) have gone public in the past fives years. Given the massive trillion-dollar opportunity, we expect many more IPOs to come from this list in the years to come.